The #WinchBiz unconference is a new event on Wednesday 9th May*, entirely devoted to helping make Winchester and the surrounding area a great place for business. 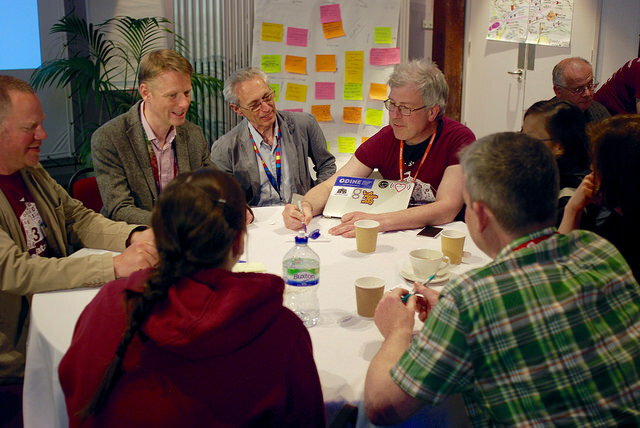 What on earth is an unconference? It’s a bit like a conference, but there is no predefined agenda, which means participants design the day as it goes along. It’s a fantastic networking opportunity – and anyone with an interest in doing business in-and-around Winchester can attend. It’s a social occasion, and there’s cake. Relaxed and informal – some participants at Open Data Camp 3 in Bristol. Ok. Why should I come? Anyone can propose a session on absolutely any topic they wish, as long as it’s associated with Winchester and business. ‘Winchester’ in this context means the whole of the District, and not ‘just’ the city. There’s no such thing as a perfect environment for business, but all sorts of things can be done to help make the place better for everyone. An unconference is a great way to identify opportunities and suggest ways to help them happen. Looking ahead we intend to have a ‘hack’ style event in a few months time, during which we’ll try to find practical solutions to some of the ‘more meaty’ problems than are identified at #Winchbiz on 9th May*. There’s no hierarchy at an unconference: everyone has an equal opportunity to speak, and a wide variety of businesses will be represented. At the time of writing, around 80 people have registered to attend, and we’re expecting 100-150 in total. These are just some of the businesses who have signed up so far, and there’s still time to register. Organisations who have already registered for #Winchbiz. The unconference has been instigated by the Economy and Arts team within Winchester City Council, who are the main sponsor and host. We are most grateful to them, and to our sponsors** Drawnalism, Konexus Consulting, Nquiringminds, and UKGovCamp. Look out for our next post about what to expect when you come to Winchbiz! ** It’s not too late to sponsor. If you are interested, see our info for sponsors, or get in touch.